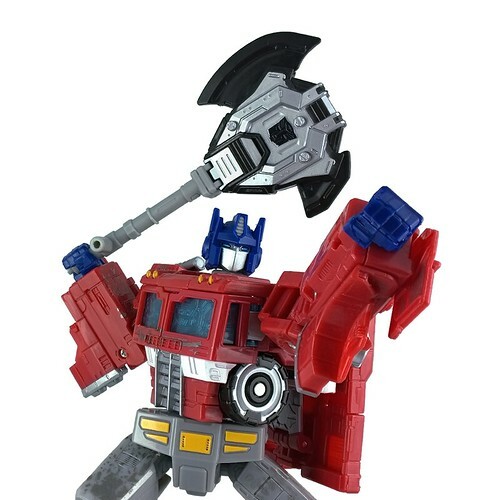 Both of Prime's weapons include 5mm joints so you can attach the axe handle to the business end of the rifle in case you ever feel Prime has a pressing need to shoot a battle axe at somebody's face. For an even more absurd example of 5mm connectivity, there's a photo floating around of a Siege Hound with every Transformer figure in existence, more or less, attached. It's a mass of super-dense plastic on the verge of flouting the laws of physics. Transformers figures have had 5mm joints since 1984 due to their Takara SF Land lineage but Siege is taking this to a whole new level. There hasn't been this much emphasis on 5mm connectivity since the Takara Blockman/Robotech Robolinks line.